You’ve decided that carpet is the best flooring choice for your home. Now what? There’s a lot to consider and many great options from which to choose. Today’s carpet offers a wide variety of choices in style, fiber composition, and color. CRI is here to help you find the perfect carpet for your needs. How is the room going to be used? Will it have heavy or light traffic? Will the room be the center of activity for family and entertaining? Is there direct access from outside, or will the carpet be away from entrances? Will the carpet receive direct sunlight? 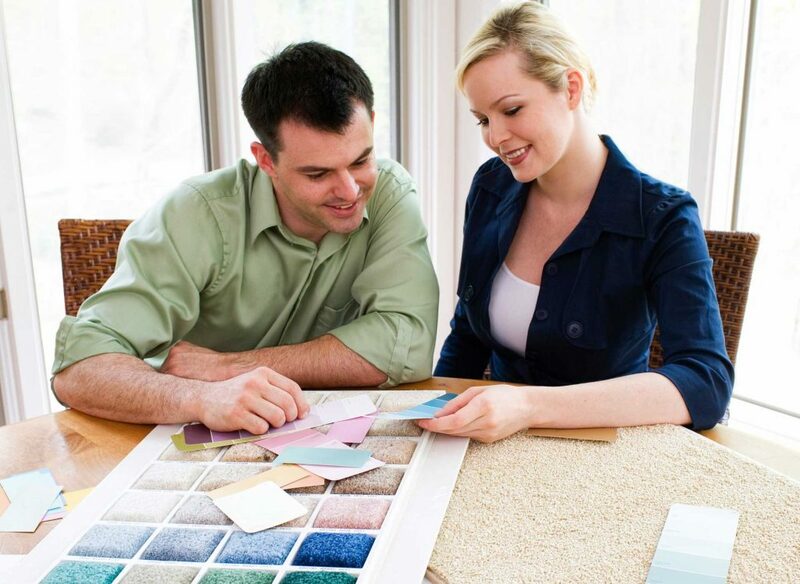 Your answers will determine many of your choices, from color to carpet construction, and much more. If you still have questions, your carpet dealer should be able to provide guidance. If a room is your interior design canvas, carpet is your paintbrush. It can be neutral, complementing the other visual elements in the room. It can also be a bold, focal point of the room. Because carpet comes in nearly every color imaginable, the choice is yours. The always-popular beige carpet can make a room look open and spacious. For a bolder statement, you might match your carpet to a common color in your furniture and draperies. Environmental colors, like blues, deep greens, rosy quartz, and stony neutrals are becoming increasingly popular. Warm colors can turn up the heat in a room that lacks light, while cool greens and blues have a calming effect. Lighter colors make the room seem larger; darker colors provide an extra level of comfort. There are also practical considerations in color selection. New stain and soil-resistant technology make today’s lighter color carpet much easier to clean, allowing for more decorating options. Medium and darker colors, tweeds, and textures are good at hiding soil in your home’s high-traffic areas. One final consideration: the color of your carpet will look different under different lighting conditions. So make sure to take your samples home and look at them in the correct lighting conditions. Carpet is constructed in several different ways, along with a variety of fibers. Understanding the strengths and differences of each will help you make the right choices for your lifestyle, home, and budget. Cut Pile: One of the most popular constructions, cut pile achieves its durability through the type of fiber used, density of tufts, and the amount of twist in the yarn. Highly twisted yarn will hold its shape longer, making it a smart choice for high-traffic areas. Textured Plush – Decorative and versatile. Textured surfaces help hide footprints and vacuum marks. Add causal beauty to any room. The preferred style for busy households. A great carpet for the entire home. Saxony – Refined surface. Works well with traditional interiors. Ideal for living and dining rooms. Friezé – Forms a “curly” textured surface because yarns are extremely twisted. Has an informal look. Helps minimize footprints and vacuum marks. Plush (Velvet) – Dense, luxurious feel. Shows footprints and vacuum marks easily. Best for low traffic areas and formal rooms. Loop Pile: Here loops are the same height, creating a uniform look. This style generally lasts a long time in high-traffic areas. Many of today’s popular Berber styles are level loop styles with flecks of a darker color on a lighter background. Multi-level loop pile: This style usually has two to three different loop heights to create pattern effects, while providing good durability and a more casual look. Cut-loop pile: This carpet style combines cut and looped yarns. It provides a variety of surface textures, including sculptured effects of squares, chevrons, and swirls. The multi-color attribute is effective at hiding soil and stains. 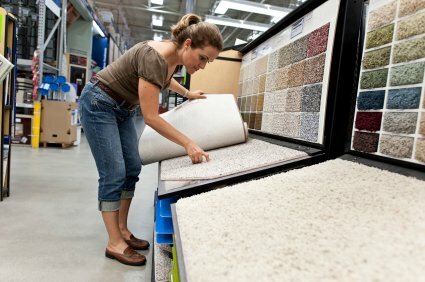 To get the best performance and most enjoyment out of your carpet it’s essential to select a carpet fiber that fits your needs. The majority of the carpet produced in the United States contains one of five primary pile fibers: nylon, polyester, polypropylene (olefin), triexta, and wool. Synthetic fibers represent the vast majority of the fiber used to manufacture carpet in the U.S. Each fiber type offers somewhat different attributes of durability, abrasion resistance, texture retention, stain and soil resistance, colorfastness, ease of cleaning, and color clarity. 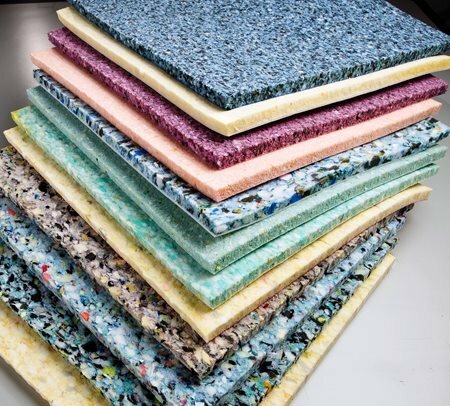 Manufacturers, retailers, specifiers, and designers are valuable resources in helping you determine the most appropriate fiber and carpet construction for your needs. The cushion is an unseen but essential part of your carpet system experience. It’s well worth the time to ensure you’re picking the best option. A firm and resilient carpet cushion forms the foundation for your carpet. The right cushion acts as a shock absorber to increase comfort and extend durability of carpet. It also improves acoustics and provides increased insulation, making a room quieter and warmer. When selecting cushion, check the carpet manufacturer’s requirements for thickness and density. A general rule of thumb for most residential carpet applications is to choose cushion no more than 7/16 inch thick and no less than 1/4 inch with 6 pounds per cubic feet density. If the carpet is a berber or a low profile carpet, choose a cushion no more than 3/8 inch thick with 8 pounds density. The type and thickness of cushion you need varies based on traffic levels and patterns. For example, bedrooms, dens, lounge areas, and other rooms with light or moderate traffic can use thicker and softer cushion. Living rooms, family rooms, hallways, stairs, and other heavy traffic areas require thinner, firmer cushion. The wrong carpet cushion can negatively affect the carpet in several ways, including diminished appearance, wrinkling, buckling, separation of the carpet seams, and breakdown of the carpet structure itself. Improper cushion selection also may void any warranties from the carpet manufacturer. Residential cut pile, cut-loop, or high-level loop carpet requires a resilient, firm cushion with a thickness of 7/16 inch and no less than 1/4 inch with 6 pounds per cubic feet density. Types of cushion may be various polyurethane foams, including the very common bonded foam product often referred to as “rebond,” fiber, or rubber. Berber carpet, thinner loop, or cut pile carpet is made with large, wide loops, and it has been found that a stable, low-flexing, cushion is necessary. A thicker, softer cushion is not acceptable. Cushion thickness should not exceed 3/8 inch for these type products. Again, check with the carpet manufacturer to see if a specific cushion is required. Indoor air quality (IAQ) is of growing importance because of the amount of time we spend indoors. CRI’s Green Label Plus program for carpet, cushion, and adhesives sets a higher standard for IAQ and ensures that customers are purchasing the very lowest emitting products available. In fact, the program has such a positive impact on the indoor environment that the American Lung Association approves of its use in its Healthy Homes programs. Additionally, the Green Label Plus program’s tough standards exceed the green building requirements dictated by California schools. So if you are concerned about asthma, allergies, or VOCs, be sure to ask about Green Label Plus carpet, cushion, and adhesive options for your home.